According to a statistic that we made up but is probably real, 65% of the average American's diet is made up of beer and cheese. 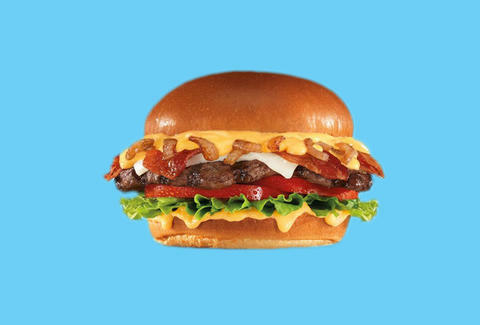 Helping America reach that seemingly impossible 100% goal is Carl's Jr./Hardee's Budweiser Beer Cheese Bacon Burger. If you've never had the pleasure of eating beer cheese, it's a lusty combination of beer, cheese, flour, milk, and mustard all mixed up until you get a delicious dipping sauce (consider it Wisconsin's answer to queso). And here's the lowdown on the burger: a brioche bun, a grass-fed burger patty (though you can also order it with a Thickburger patty if you don't like your cows raised as humanely), applewood-smoked bacon, caramelized onions, Swiss, and a hot cheddar cheese sauce blended with Bud. A grass-fed single will run you $5.59 at participating locations, and a double is $6.89. But no matter how you order it, if you're smart, you'll use this $1-off-a-combo coupon. If you're not hungry enough to order a burger, but still want that Bud beer cheese sauce, just ask for them to pour it directly into your mouth! When that doesn't work, order the also-new Budweiser Beer Cheese Fries, which also come topped with crumbled bacon. Lee Breslouer is a senior writer for Thrillist, and enjoys a good burger. Follow him to beer cheese sauce @LeeBreslouer.